Utility Pole Solutions purchases surplus steel transmission poles and makes them available for immediate delivery. 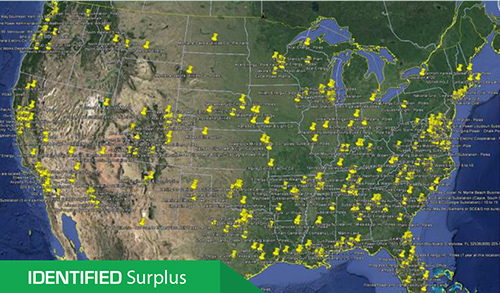 We have an inventory of around 1350 steel transmission and distribution poles in 8 pole storage yards across the US. This inventory enables us to engineer and deliver poles to your exact specification in a matter of weeks. All poles are engineered in PLSpole by a PE . Many poles have not been used and come with the original anchor bolt cage. Most of our pole orders are delivered in 2 weeks or less. Some of our customers need help specifying their steel poles. We can assist you in determining what is required in terms of loading, attachments and foundation design. Utility Pole Solutions provides surplus steel pole inventorying services. We’ll inventory your steel poles, identify drawings and maintain an inventory of your company’s surplus. We are experienced at helping companies utilize their surplus inventory including specific pole selections. Utility Pole Solutions is always looking for additional surplus steel poles to add to its inventory. Either we will buy the poles outright or we will add them to our inventory list and sell them for you.